“This is about holding all programs accountable,” said Sanchez Fuentes. 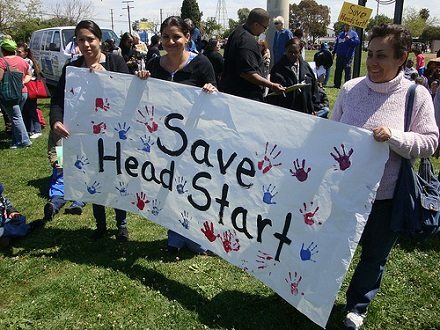 But Head Start agencies may aim at holding the administration accountable. Head Start programs in 10 states have sued the administration, charging that the application of the new regulations is unfair because they hold programs accountable retroactively for shortcomings that date back a couple of years (and presumably might have been addressed and resolved during that time). Perhaps more troubling, the lawsuit also alleges that the administration manipulated the rules so that at least 25 percent of the Head Start programs would be classified as deficient. Implicit in this allegation may be the idea that finding that large of a slice of programs out of the competition would open up the program to the new, outside players that the administration—and Republicans in Congress—think would add more bottom line efficiency and effectiveness to the program. Many, including Steven Barnett, the director of Rutgers University’s National Institute for Early Education Research, increasingly think that the accomplishments of Head Start and its impact on pre-kindergarten children have been overstated. An HHS analysis says that as many as 44 percent of Head Start programs could ultimately be classified as deficient under the regulations.